Dave Splash Dot Com: Why Is It Fridays Only Come Once a Week? Why Is It Fridays Only Come Once a Week? Paul Weller (former leader of The Jam and The Style Council) is celebrating 30 years in the music business with a new boxed set called Hit Parade, and a series of sold-out concerts in New York and Los Angeles. 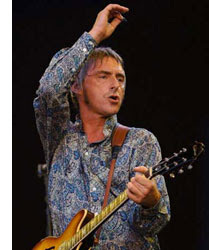 Weller was interviewed in Billboard Magazine, and he talks about his impressive career. Another right-wing myth debunked: The "liberal" media. According to testimony from a top aide to VP Cheney, whenever the Administration wanted to "control [the] message" they arranged for Cheney to appear on Meet The Press with Tim Russert. Obviously, they felt an appearance with the "hard hitting journalist" was a great way to advance their agenda. But the media is all liberal, right? Even though she lost by the widest margin of any Republican in the country in her bid to become a Senator from Florida, that hasn't stopped Katherine Harris from schmoozing other Republicans during the State of the Union. The GOP embarrassment and 2000 election villain, was spotted on the floor of the house passing out business cards before the speech. Not sure what the cards were promoting. Political consulting? Lobbying? Scott Baio is now shopping around a new tell-all book to publishers tentatively titled, BaioWatch: How I Dated and Loved Hollywood's Most Beautiful Women and Ended Up Alone. Baio has dated some A-listers like Heather Locklear and Pamela Anderson (she was A-list at one time), but the funniest excerpt comes in the form of a proposition from Liza Manelli. She apparently said, "I really want your sperm. You're a talented, good-looking Italian guy. That's what I want my child to be." Ewww. Tom Delay wants to be president...of the conservative movement. He thinks the blogosphere is too dominated by liberals, and the "culture war" has not been fought hard enough. Yes, he sounds crazy enough to be a right-wing leader. The only real show of merit this weekend is Saturday night at Sokol Underground. Ladyfinger (ne) is playing along with Paria, No Action, and The Stay Awake. Although I like Ladyfinger a lot, I am a little tired of them at the moment. I think I'll probably skip it. The Stay Awake is a band I haven't seen in a while, so maybe I could stop in early and bolt after they are done. I don't know. Country music singer Toby Keith (who conservatives pointed to as a legitimate artist -- unlike Dixie Chicks -- because of his support for the Iraq war) now states that he always been against the Iraq War. WTF!? He also says he is a registered Democrat (yet he performed at Bush rallies throughout 2004). But he won't forgive the Dixie Chicks for being correct on the Iraq War -- he is still feuding with them. I wonder if you would call Scott's book an "Autobaiography?"